wine house. Satelite TV, video and DVD player. Renting contract: Renter and owner sign a renting cotract with general conditions. Reservation deposit: Renter pays 30% reservation deposit in period from the contract. Other at arrive. We had a wonderful holiday in Slovenia, the host was very welcoming. We were made to feel at home. The outside eating area and fire/barbeque was wonderful. The house was very typical,rustic and dark and cool inside. The area was outstanding for beauty, wonderful lakes, rivers, walks, we loved it. Les équipements sont très rudimentaires. Les salles de bain (2) sont peu pratiques. Surtout une, très peu accessible. Par contre Borut vaut à lui seul le détour. Très sympathique et dévoué. Previous visitors at the height of the season in August 2018, there were 12 visitors of the punk festival, leaving them with some kind of mistake on the equipment that was not observed during the cleaning, for example the wash leak and the clogged drainage hose. The bathrooms are two, with shower cubicles and also an additional outside shower, HotTube and a swimming pool that do not pose problems for younger generations of visitors. The style of equipment in the kitchen corresponds to the style of the centenary country house in the Triglav National Park. Sehr persönliches Haus mit toller Atmosphäre und sehr freundlichem Vermieter. Mitten in der Natur, mit traumhaften Rundblick, ein unvergesslicher Urlaub ! Das Haus hat alles, was es hier verspricht und noch mehr. Der Pavillon lädt für gemütliche Abende am Feuer ein, der Pool ist toll, sauber und gepflegt und im Haus fehlt es an nichts. Der absolute Hammer aber ist der Jakusie. Unvergessliche Stunden haben wir dort verbracht. Danke Borut, für tolle Gastfreundschaft ! Bellissima casa, attrezzata di tutto, immersa nella natura. Accoglienza ottima con frutta fresca in tutte le camere e addobbi natalizi molto graditi. Posto ideale anche per chi, come noi, viaggia con cani a seguito. Ein unvergesslicher Urlaub. Nach langer Fahrt wurden wir freudig von einem sehr netten, hilfsbereiten Vermieter mit Wein und einer üppigen Obsttafel begrüßt. Das Haus war stifvoll eingerichtet und zeigte gleich, das das Herz des Vermieters an diesem Objekt hängt. Es ist sehr sauber und gepflegt, in jedem Zimmer standen frische Blumen. Abends kann man den Tag gemütlich am Feuer ausklingen lassen mit einem Glas Wein, welches man sich selbst im Schuppen aus einem Weinfass zapft. Der beleuchtete Pool, die Stille und die herrlichen Berge werden uns wohl immer in Erinnerung bleiben. Danke Borut für diesen unvergesslichen Urlaub - wir kommen wieder!!! 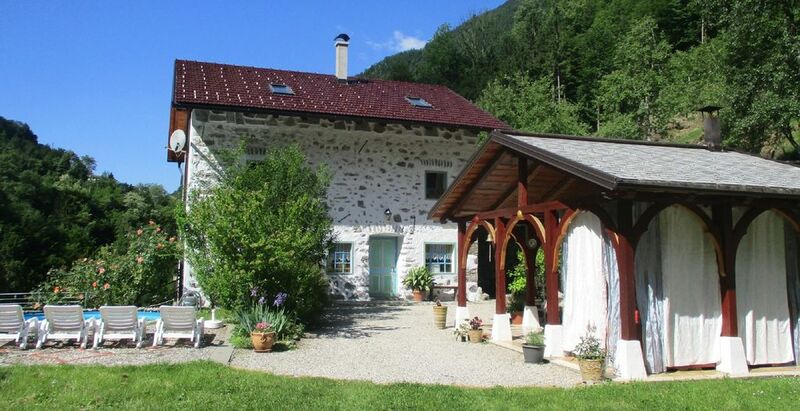 House stays in Triglav national park, on 230m, near small river Zadlascica and it is surrounded with mountains from 900 to 2100 m. Nearest town with shops and restaurants is Tolmin, (6km). To Klagenfurt is 105 km, to Adriatic sea is 50, to Ljubljana 105, to Venice 175 km. Historical is all area known from 1.st world war: Soca valley front 1915-1917. Golf: First Golf place is in mountain area in Soca Valley near Bovec, 34 km. Second in Lipica 73 km away from Tolmin. Ski: 1.) Ski Center Cerkno (900m usl) is 50 km from Tolmin. 2.) Ski center Kanin, Bovec (1800-1350m usm) is 36 km from Tolmin. In reason of long period with no touristic season in Soca valley in Tolmin area, (7 months from October until May following year), Owner and a Renter make a deal in moment of booking on the base of Renting contract (in menu Property-Rulles and policies), about paying a reservation deposit of 500 € to owner, wich will turned back to a renter, on the day of his arrive, from his total payment. Prices are for a week, for 8-10 persons. For groups of less persons, 2, 4, 6, please contact the owner to arrange the price. Hot tube is open from 27.th April until 15.th September.